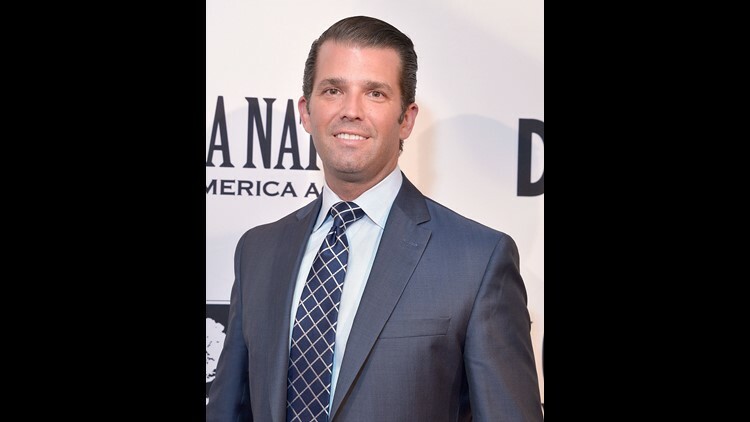 Donald Trump, Jr. attends the Washington premiere of the film, "Death of a Nation," at E Street Cinema on Aug. 1, 2018, in Washington, D.C.
WASHINGTON – President Donald Trump's pledge to "drain the swamp" – a metaphor for ending Washington corruption – is one of his best-known refrains. But the president's oldest son, Donald Trump Jr., is literally up to his neck in some of the murkiest, greenest swamp water out there in a picture shared on his Instagram account Sunday from his weekend trip to Louisiana. "This is what happens when someone bets me a good sum that there’s no way that the guy from New York City would swim in a gator infested swamp/bayou down in Louisiana," Trump Jr. said in the post. "Easy money!!!" Trump Jr. didn't just go swimming with the gators. On Saturday, he joined House Majority Whip Steve Scalise, R-La., in a $5,000-per-head annual alligator hunt to raise money for Louisiana Attorney General Jeff Landry. Also down on the bayou with Trump Jr. was his new romantic interest, former Fox News host Kimberly Guilfoyle. At least animal rights activist on Twitter took issue with the using an alligator hunt to raise campaign funds. Kimberly Guilfoyle pouts next to a tray of roasted #alligator and pig during a day out #hunting with . @DonaldTrumpJr 😷 Slaughtering #animals to RAISE MONEY for #GOP politician. Trump Jr. discusses the expansion of Trump hotels on June 5, 2017, in New York. President Trump greets Trump Jr., his wife, Vanessa, and the NRA's Chris Cox after speaking to the National Rifle Association Leadership Forum at the Georgia World Congress Center in Atlanta on April 28, 2017. Trump Jr. holds his daughter Chloe and son Donald Trump III as they walk off Air Force One at Andrews Air Force Base on April 16, 2017. Trump Jr. speaks to media during the annual White House Easter Egg Roll on the South Lawn on April 13, 2017. Trump Jr. and his brother Eric attend their father's announcement of Neil Gorsuch as his nominee for the Supreme Court in the East Room of the White House on Jan. 31, 2017. Trump Jr., his wife, Vanessa, and their daughter Kai attend the White House senior staff swearing-in on Jan. 22, 2017. Trump Jr. and his sister Ivanka arrive on Capitol Hill for their father's inauguration on Jan. 20, 2017. Trump Jr. is pictured at Trump Tower on Jan. 18, 2017. Trump Jr. and Ivanka Trump join their father at his news conference on Jan. 11, 2017, in New York. Trump Jr. is pictured at Trump Tower in New York on Dec. 6, 2016. Trump Jr. arrives at Trump Tower for meetings with his father on Nov. 15, 2016. Trump Jr. places a hand on the shoulder of his father at a rally on the final night of the presidential campaign at the SNHU Arena in Manchester, N.H., on Nov. 8, 2016. Trump Jr. stands with his father after the first presidential debate at Hofstra University in Hempstead, N.Y., on Sept. 26, 2016. Trump Jr. delivers a speech on behalf of his father as he campaigns at the Neshoba County Fair in Philadelphia, Miss., on July 26, 2016. Trump Jr. speaks on the second day of the Republican National Convention at the Quicken Loans Arena in Cleveland on July 20, 2016. Trump Jr., Ivanka Trump and Eric Trump celebrate on the convention floor during the second day of the Republican National Convention in Cleveland on July 19, 2016. Eric Trump, Donald Trump Jr. and Ivanka Trump attend the official opening of the Trump Turnberry hotel and golf resort in Turnberry, Scotland, on June 24, 2016. Trump Jr. is introduced by his father at the Indiana Farmers Coliseum on April 27, 2016, in Indianapolis. Trump Jr. holds his daughter while he speaks with reporters as he arrives at a polling station during the New York primary on April 19, 2016, in Manhattan. Trump Jr. looks on as his father speaks at a caucus night watch party at the Treasure Island Hotel & Casino on Feb. 23, 2016, in Las Vegas. Trump Jr., Eric Trump and Ivanka Trump attend the 9th Annual Eric Trump Foundation Golf Invitational Auction & Dinner at Trump National Golf Club Westchester on Sept. 21, 2015, in Briarcliff Manor, N.Y.
Trump and his sons attend the "Celebrity Apprentice All Stars" Season 13 press conference at Jack Studios on Oct. 12, 2012, in New York City. Trump Jr. and his sister Ivanka pose inside the Chicago offices of their father near the site of his 92-story residential tower under construction along the Chicago River on May 10, 2006. Trump Jr. and his sister Ivanka pose for a photo on the penthouse terrace of the Trump Park Avenue building in New York on April 11, 2006.